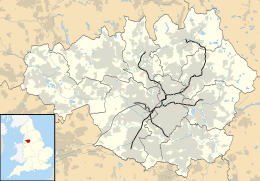 Bury Interchange is a transport hub in Bury, Greater Manchester, England. Opened in 1980, It is the northern terminus of the Manchester Metrolink's Bury Line, which prior to 1992 was a heavy-rail line. It also incorporates a bus station. Bury Interchange was opened by British Rail in March 1980, integrating a new bus station with the northern terminus of the Bury-to-Manchester heavy railway line, a new short spur line was constructed to connect the new station. The railway originally ran into Bury Bolton Street which was closed by British Rail, and is now operated by the heritage East Lancashire Railway. 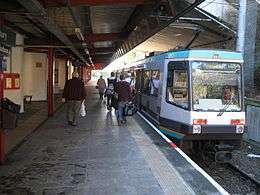 The railway was redeveloped in the early 1990s to become part of the Manchester Metrolink network, forming the northern terminus. The interchange is managed by Transport for Greater Manchester and has recently been refurbished, improving facilities and security for passengers. In 1994, pensioner Shirley Leach was murdered at the interchange on her way home from visiting her sick daughter in hospital. Despite the case going cold, DNA evidence finally convicted her killer in 2006. The majority of services are run by First Greater Manchester and Rosso with the remainder of services run by Arriva North West and Stagecoach Manchester. Now-defunct operators which have run services to or from the Interchange in the past have included Ribble Motor Services, Crosville Motor Services, Yelloway Motor Services, The Bee Line Buzz Company, Burnley & Pendle, Bolton Coachways, Mayne & Son, Citibus, Shearings, Blue Bus, Maytree Travel and JP Travel. There are frequent buses running to Manchester, Rochdale, Bolton, Middleton and Rawtenstall plus several parts of the Bury area including Heywood, Radcliffe, Ramsbottom and Tottington. Buses also run from Bury to Accrington, Bacup and Burnley. Class 504 units at the interchange in 1983. A Class 504 leaving the station. In the right-hand corner, you can see the island platform layout of the station, which remains today. Poet Ron Silliman's neon sculpture From Northern Soul (Bury Neon) is displayed at the entrance to Bury Interchange. ↑ "Bury Interchange in line for safety improvements". GMPTE. Retrieved 2008-01-19. ↑ "Man found guilty of shirley leach murder". DNA Evidence Led to Shirley Leach Killer. Retrieved 2010-11-09. Wikimedia Commons has media related to Bury Interchange.